During the public discussion on participation in the Walton Hard Labor Creek Reservoir Project, much attention was given to current use and projected growth of water use and revenue for Oconee County. Little media attention has been devoted to Oconee Water Sales to Walton County. Sales continued well into the current drought period.Walton County is not one of the four counties in the Upper Oconee Basin Water Authority that owns Bear Creek Reservoir in Jackson County. QUERY:Were the Walton figures included in the Revenue calculations and projections? QUERY:How much has revenue gone down since discontinuing the Walton Sales? QUERY: How much reduced revenue has resulted from citizen Water Conservation efforts? Since the media has been reporting on conservation efforts and results in area counties, there are reports that Oconee County has reduced its consumption below last year’s use. The Governor has mandated a 10 % reduction in use over last year. Oconee, as a growing county with more houses and customers, would normally face a challenge in meeting that goal. Citizens have responded to conservation efforts in a commendable way. QUERY: Were the Walton County Sales figures used to calculate the decline in Oconee water use over last year’s consumption? Oconee County Agreement approved March 5, 2002 for up to Million Gallons per day to Walton County. Sales began on opening of Bear Creek Reservoir in mid-2002 and continued monthly through September 2007. The figures below are for the last six months of sale, after water conservation had started, and was produced by Oconee County Government in response to an Open Records Request. At least one area system already has cut its winter water use enough to avoid EPD fines - Oconee County. There, water-conscious citizens actually are using about 20 percent less water than they did last winter……..
Those that don't comply will face fines imposed by the state Environmental Protection Division. But some water systems, especially in fast-growing areas, will have a tougher time than others meeting those mandates……. There, water-conscious citizens actually are using about 20 percent less water than they did last winter, said John Hatcher, Oconee County public utilities director. Last winter's average water use in Oconee was about 71 million gallons a month, meaning the system had to cut back to about 64 million gallons per month to satisfy Perdue's mandate. The Oconee County system pumped about 57 million gallons of treated water in October, about double the reduction needed, Hatcher said - mainly due to public awareness of the drought and householders doing what they can to help. "We've had a lot of support from the community. Their conservation has been key for us," he said. Oconee County may have it easier than some other counties when it comes to water conservation, where most water use is residential and public awareness can make a big difference. Cities with big industrial and commercial users may have a harder time cutting use without also cutting into their economies, Hatcher said. News and comments about developments in Oconee County. The drought seems finally to have focused almost everyone’s attention on water, or the lack of it. *Oconee County officials are using the drought to justify the County’s decision to join with Walton County to build the $ 350 million Hard Labor Creek reservoir in Walton County. The Hard Labor Creek reservoir project is an interesting case to consider. This reservoir is not designed to address current needs, but rather to provide for future development in the County. Whether the final cost is $ 49.8 million, $ 66 million, or something even higher, it is supposed to be paid for by growth in the demand for water in the county resulting from future development. 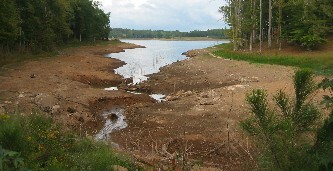 So why were Oconee and other officials so slow to take action as the drought progressed? Selling water is how the counties get the money to build and operate reservoirs and water treatment plants. It is difficult to balance the budget if people stop using water, either because of a ban on watering or because of an imposition of conservation pricing, which pushes down demand by charging a higher rate at higher levels of water consumption. Oconee County does not use conservation pricing. Counties have few options to make up for lost sales. They can increase water rates, or they can shift the burden onto property owners through higher property taxes. To pay off current indebtedness and then to finance construction of the Hard Labor Creek reservoir, Oconee County projects it will need for water sales to increase the 8% each year. That includes 2007. Given the current water ban, growth of any sort is unlikely in 2007. Which helps to explain why the County was so slow in going to the total ban.